The sound I am referring to occurs a little more than halfway through the film. When the millennium falcon is in hyperspace, Han and Rey are struggling to figure out what is about to cause the falcon to blow up. 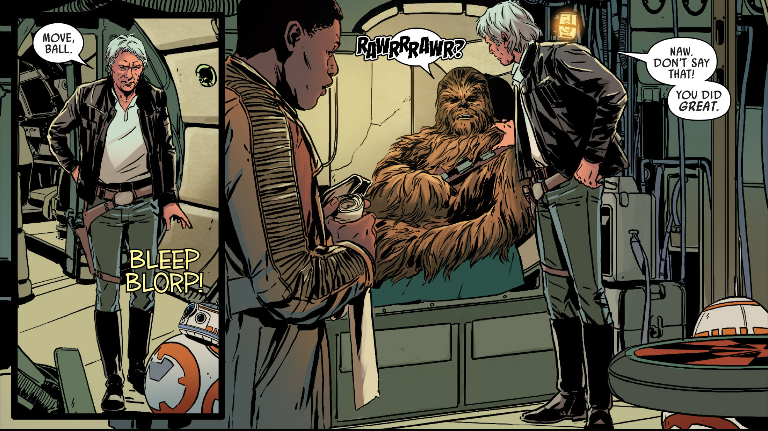 Then Rey pulls out a piece of circuitry, tells Han that she "bypassed the compressor". In response, Han says "Huh", then exits the cockpit. This is where the noise occcurs, just after Han exits the cockpit, as he passes BB-8 on his way to Chewie. It sounds like a deep robotic voice saying "move on" (it almost sounds like general Grievous in Ep. 3), but I very well could be mistaken. Does anyone know what this noise is? P.S. I apologize if my explanation of the scene is unclear. I will look for a clip of the scene and add it to the question in an edit. Rey: I by-passed the compressor. Re-watching the scene, it seems as though the robotic quality of the line is just Han's voice echoing a bit as he passes through the (relatively narrow) corridor out of the cockpit. What are the aliens species in the “Star Wars: The Force Awakens”? Was the 'Official Novelisation' of Star Wars: The Force Awakens based purely on the (written) screenplay? What's the fate of Coruscant in Star Wars: The Force Awakens?